Being part of the majority isn’t always a bad thing – and it’s actually a bonus if you’re visiting the Okanagan for the same reason as so many others: wine touring. The geographical definition of where the grapes for certain wines are grown is called appellation, and the characteristics bestowed upon the wine from its place of origin and grape genetics is known as its terroir. The Okanagan appellation is noteworthy in the world of wine production as an ideal climate for grape growth. Also, the onset of climate change has pushed the Okanagan wine region up the ranks in terms of demand, as more southern geographical wine regions are becoming warmer, their crop is affected. California and French wine industries are feeling the heat, however these changes are causing an increase in popularity for Canadian wine around the world. The Okanagan Valley is becoming popular because the region is the second largest producer of wine in the country, and the northwestern climate is resilient, allowing for efficient grape production. Be sure to visit the following wineries to obtain the best wine tour experience the Okanagan Valley has to offer. We came up with three very popular Okanagan Wineries that are worth your visit when staying in Kelowna, be sure to add these to your list of wine tour destinations! Established in 1966 by a local business group for approximately $500,000, Mission Hill Winery boasts a number of distinct wine flavors and runs one of the most pristine operations in the Okanagan Valley appellation. That’s not all! On top of being a very efficient producer of amazing wines (their Chardonnay is superb), Mission Hill is one of the best tourist attractions in Western Kelowna. Mission Hill was the first Okanagan winery to receive international recognition by winning the 1994 Best Chardonnay at the International Wine and Spirit Competition. In 1996, an architectural firm was commissioned to rebuild the winery and peripheral buildings – the jaw-dropping new version of the Mission Hill Winery was completed in 2002 at a cost of $35-million. Thew new Mission Hill look is that of a French abbey, styled to modernity. The winery’s Terrace Restaurant is an award winning location for high end Okanagan dining, with a view. Complete with a bell tower, full fledged cellar and a restaurant with an impeccable view, Mission Hill will make for an unforgettable wine tour experience. Visit Mission Hill Winery’s website for directions and additional information. Blasted Church wines are a local favorite in BC. In 1929, a group of Okanagan Falls workers travelled to an abandoned mining camp 20 kilometres away to dismantle and bring back an old church. They succeeded by planting dynamite to loosen the nails, and miraculously succeeded without damaging anything but the steeple. The church is now 120 years old and is situated in Okanagan Falls. The VQA wines by Blasted Church are favored by experienced wine drinkers throughout British Columbia for their full flavor, and those acquiring a taste for wine are often drawn in by Blasted Church’s clever labelling practices. The winery takes frequent visitors, and on their website they say to leave your “traditional wine stuffiness at the farmgate” and call themselves the most creative, inspired and fun destination for wine lovers. We couldn’t agree more. The fine and robust selection of wines at Blasted Church contains 18 different types of wine, at least on their website. They also have a great sense of humor. Visit the Blasted Church website for directions and more information on their congregation. 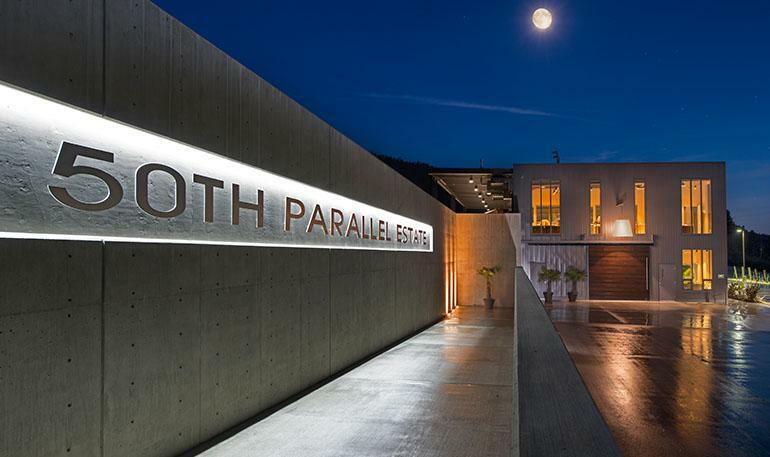 Perhaps one of the most modern wineries in the Okanagan, 50th Parallel Estate is a 61-acre Pinot wine estate with a 10,000 sq ft winery that looks akin to something straight out of a Bond film. The winery is built on a south-facing slope, with rare red granite soil yielding a rich base for the grape crop. 50th Parallel is named after the “parallel design” structure. Site lines, structure and material are meant to be in parallel with each other, creating a linear theme throughout the entire winery. Another prominent feature that makes this site worth visiting are its series of wine caves. They store all of 50th Parallel’s wine collection, and are ideal for wine touring. The first cave has a 40-person harvest-style dining and event space, and is perfect for meetings and presentations. As the winery continues to grow, the estate’s owners are constantly adding on to it. Last year they opened up a gravity-fed Pinot Noir facility, where the grape juices are gently processed using gravity rather than mechanical pumping. Every room in the 50th Parallel is created with the guest experience in mind. From the tasting rooms, to the wine shop. It’s worth it to go and experience 50th Parallel Pinot noir in the place it originated from. Visit the 50th Parallel website for more information and directions. The best way to take a wine tour in the Okanagan is to do it your way, at least that’s how we see it. The three wineries we listed above are big players in the Okanagan wine industry, but they are not the whole picture. Be sure to check out some of the areas other wineries. We found some links to online resources that are helpful to the wine connoisseurs wishing to embark on tours of the Okanagan appellation. A website with a great map featuring the all wineries in the region, with street view for some of the wineries and detailed directions. Go-to website to view when visiting Kelowna. It has entire section on Kelowna Wine Trails, a list of all 200+ wineries in the area and links to booking guided tours.